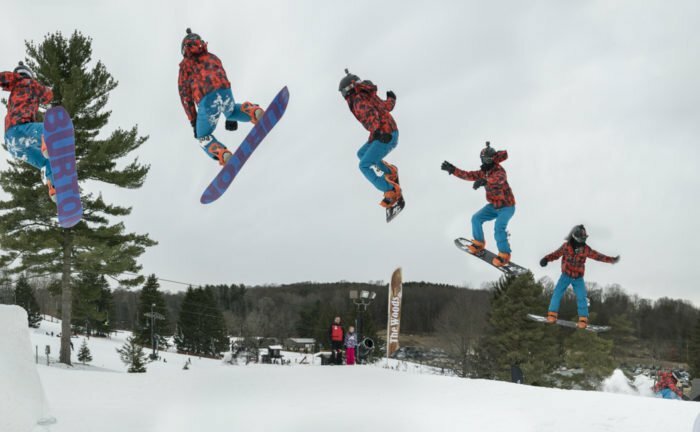 This Saturday brings the Big Air Competition at Snow Trails. The event is free and open to the public. Sponsored by the Snow Trails Ski Shop, it will take place under the lights on the Mount Mansfield slope. The course is designed for both novices and experts and has a moderate length jump to focus on “big air” and not “big distance.” All skiers and snowboarders are welcome. Registration will take place all day on Friday and on Saturday from 9:00 AM to 5:00 PM at the information desk in the main lodge, and practice will take place from 3:00 PM to 5:00 PM. Helmets and sign event waivers are mandated. Competition will begin at 6:00 PM. Prizes include cash for expert and ski shop gear for novice classes. At 9:00 PM, enjoy the band “Rock House” in The Snowflake loft (for those aged 21 and up). Last year’s Big Air event at Snow Trails created an opportunity for some great winter photography. That includes several versions of “successions” – stop action shots taken mid-flight.